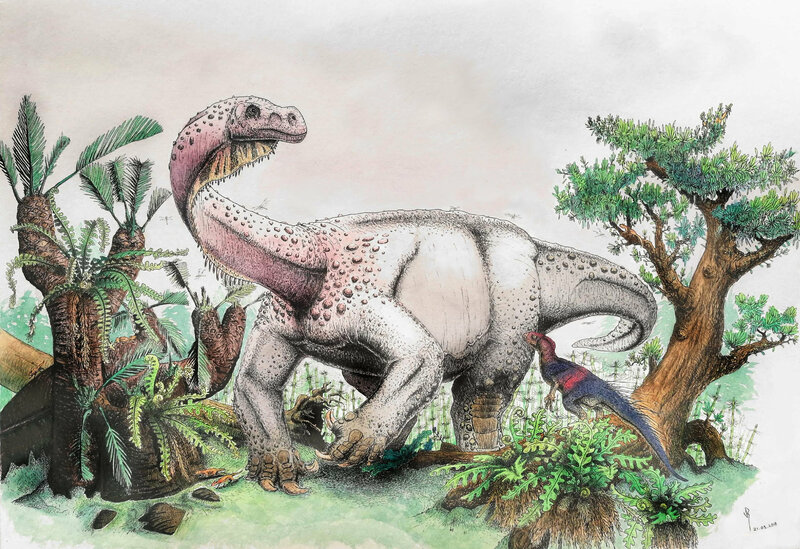 A new species of a giant dinosaur has been found in South Africa’s Free State Province. The plant-eating dinosaur, named Ledumahadi mafube, weighed 12 tonnes and stood about four metres high at the hips. Ledumahadi mafube was the largest land animal alive on Earth when it lived, nearly 200 million years ago. It was roughly double the size of a large African elephant. A team of international scientists, led by University of the Witwatersrand (Wits) palaeontologist Professor Jonah Choiniere, described the new species in the journal Current Biology today. The dinosaur’s name is Sesotho for “a giant thunderclap at dawn” (Sesotho is one of South Africa’s 11 official languages and an indigenous language in the area where the dinosaur was found). Ledumahadi mafube is one of the closest relatives of sauropod dinosaurs. Sauropods, weighing up to 60 tonnes, include well-known species like Brontosaurus. All sauropods ate plants and stood on four legs, with a posture like modern elephants. Ledumahadi evolved its giant size independently from sauropods, and although it stood on four legs, its forelimbs would have been more crouched. This caused the scientific team to consider Ledumahadi an evolutionary “experiment” with giant body size. 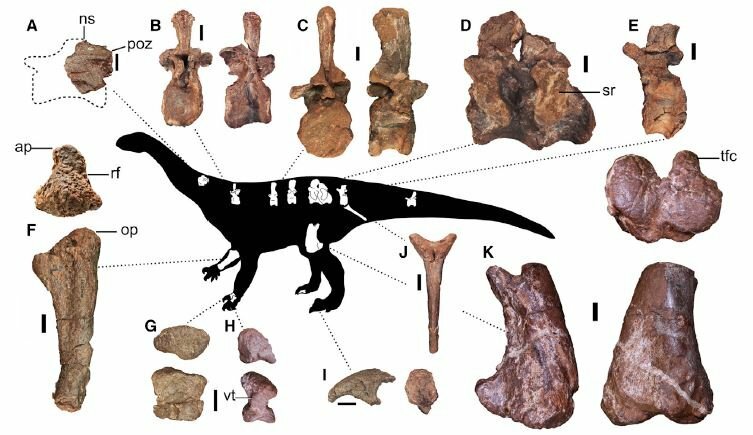 Ledumahadi’s fossil tells a fascinating story not only of its individual life history, but also the geographic history of where it lived, and of the evolutionary history of sauropod dinosaurs. 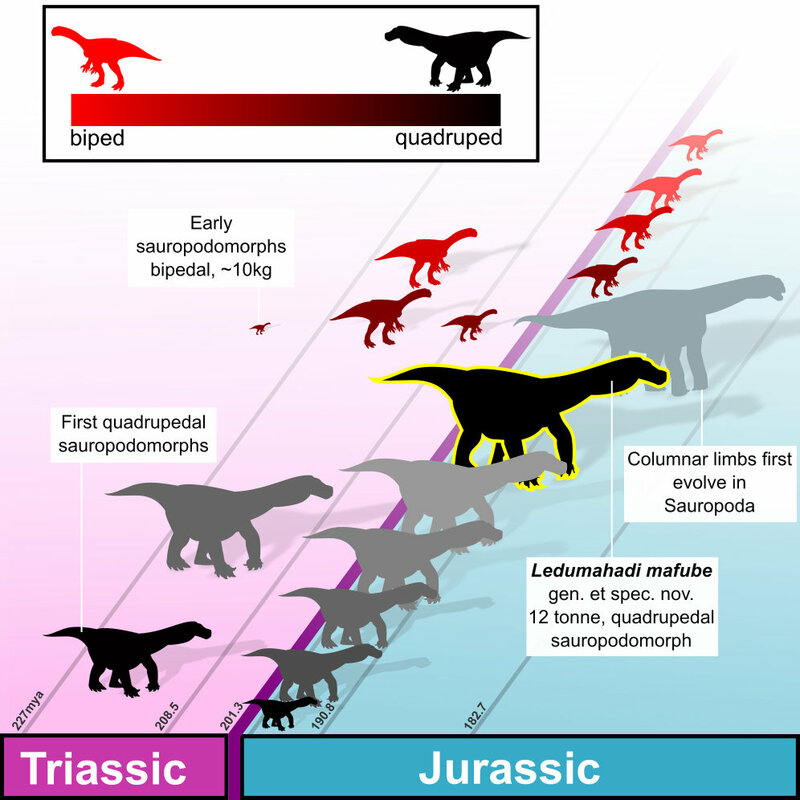 The research team developed a new method, using measurements from the “arms” and “legs” to show that Ledumahadi walked on all fours, like the later sauropod dinosaurs, but unlike many other members of its own group alive at its time such as Massospondylus. The team also showed that many earlier relatives of sauropods stood on all fours, that this body posture evolved more than once, and that it appeared earlier than scientists previously thought. “Many giant dinosaurs walked on four legs but had ancestors that walked on two legs. Scientists want to know about this evolutionary change, but amazingly, no-one came up with a simple method to tell how each dinosaur walked, until now,” says Dr. Roger Benson. By analysing the fossil’s bone tissue through osteohistological analysis, Dr. Jennifer Botha-Brink from the South African National Museum in Bloemfontein established the animal’s age. 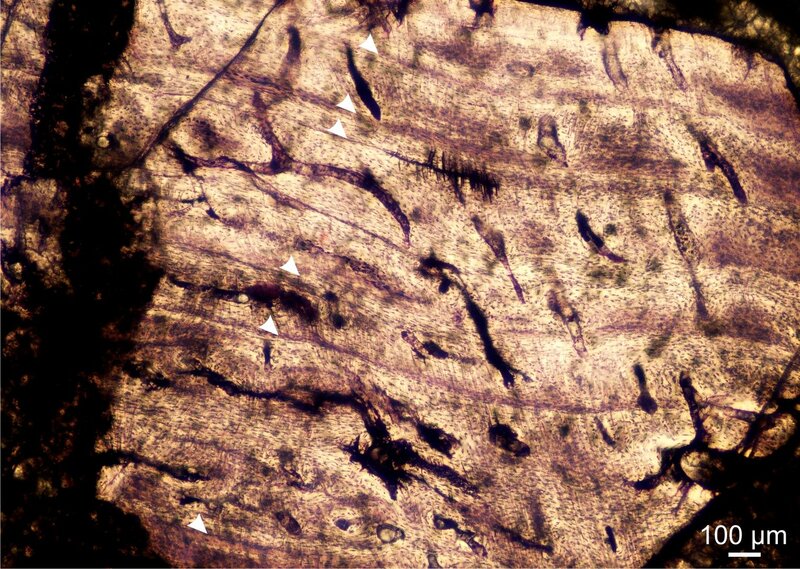 “We can tell by looking at the fossilised bone microstructure that the animal grew rapidly to adulthood. Closely-spaced, annually deposited growth rings at the periphery show that the growth rate had decreased substantially by the time it died,” says Botha-Brink. This indicates that the animal had reached adulthood. Ledumahadi lived in the area around Clarens in South Africa’s Free State Province. This is currently a scenic mountainous area, but looked much different at that time, with a flat, semi-arid landscape and shallow, intermittently dry streambeds. “We can tell from the properties of the sedimentary rock layers in which the bone fossils are preserved that 200 million years ago most of South Africa looked a lot more like the current region around Musina in the Limpopo Province of South Africa, or South Africa’s central Karoo,” says Dr. Emese Bordy. Ledumahadi is closely related to other gigantic dinosaurs from Argentina that lived at a similar time, which reinforces that the supercontinent of Pangaea was still assembled in the Early Jurassic. “It shows how easily dinosaurs could have walked from Johannesburg to Buenos Aires at that time,” says Choiniere. South Africa’s Minister of Science and Technology Mmamoloko Kubayi-Ngubane says the discovery of this dinosaur underscores just how important South African palaeontology is to the world. “Not only does our country hold the Cradle of Humankind, but we also have fossils that help us understand the rise of the gigantic dinosaurs. This is another example of South Africa taking the high road and making scientific breakthroughs of international significance on the basis of its geographic advantage, as it does in astronomy, marine and polar research, indigenous knowledge, and biodiversity,” says Kubayi-Ngubane. The research team behind Ledumahadi includes South African-based palaeoscientists, Dr. Emese Bordy and Dr. Jennifer Botha-Brink, from the University of Cape Town and the South African National Museum in Bloemfontein, respectively. The project also had a strong international component with the collaboration of Professor Roger BJ Benson of Oxford University and Dr. Blair McPhee, currently residing in Brazil.